I love public speaking, but it didn't start out that way. When I taught public speaking in graduate school, I was never more scared than when I walked into that classroom on the first day! It was trial under fire. But we all – students and teacher – learned something about public speaking that semester! I’m happy to keynote your event, run a workshop or be part of a panel. We’ll negotiate a fee for my speaking and you'll reimburse me for my travel expenses. Check out my latest speaking video from the 2017 Engage for Good Conference in Chicago. Selfish for Good: How to Turn Charity Dollars Into Marketing Dollars (And Still Save the World) NEW! All of my speaking appearances include an interesting, knowledgeable, well-organized, prepared and humorous speaker. I throw in a wicked Boston accent for free! 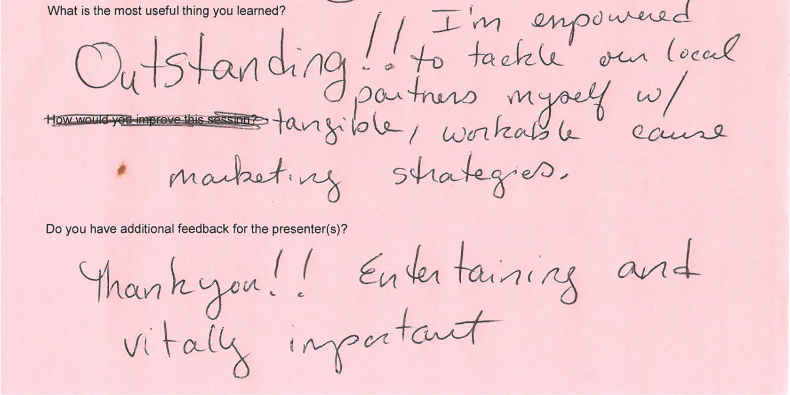 Audiences describe my presentations as actionable, how-to, practical, forward-thinking and step-by-step. As one listener wrote below, "Oustanding!" What you read on my blog is what you get – but you get it in person and adapted for your audience. They'll get a full set of slides and all the resources (articles, blog posts, tutorials) they’ll need to get started the moment they leave the room. If you have additional questions about my availability or suitability for your event, email me at joe@selfishgiving.com. New Strategies for Nonprofit Organizations - Georgetown University, Washington, D. C.
"Our group was enthused by the insights and ideas you shared. They were engaged from the moment they met you. Thanks!" 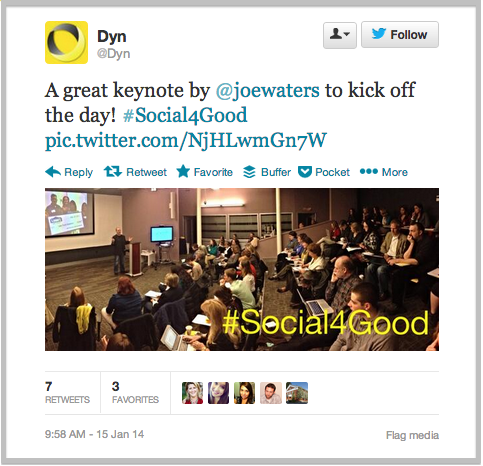 Dyn Social Media Bootcamp for Nonprofits - Manchester, N. H.
Rebuilding Together National Conference - Washington, D. C.
“Joe was the closing keynote for a one day fundraising symposium – not an easy spot. 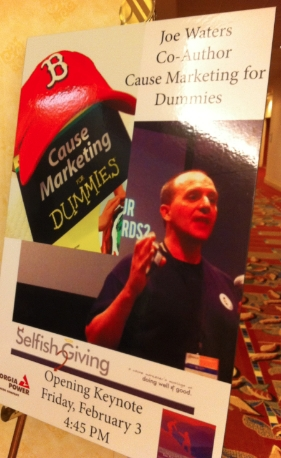 I’m the author of three books: Fundraising with Businesses, Cause Marketing for Dummies and QR Codes for Dummies. I’ve contributed to The Huffington Post, The Chronicle of Philanthropy, Mediapost: Causes, Forbes and The Nonprofit Quarterly. I also served as the technical editor of Raising Digital Families for Dummies and Social Media Engagement for Dummies. I write regularly for Razoo.com, About.com, For Momentum and others. View my online writing portfolio here. All of the above links will give you a good preview of my work. If you’re looking for more check out the 1,000 posts on my blog! "You have to build relationships for guest posting and start bringing in high-caliber bloggers to write for your blog. Outreach and guest blogging are very difficult disciplines these days . . . . If you want to get results, you must learn how to stand out from the crowd and build serious relationships with the right partners. It takes a time, and you should have started already." I can do ghost or byline and my rates are reasonable. I write about what I know: cause marketing, nonprofits, branding, technology, blogging, social media, mobile and how all these things link back to, well, cause marketing, corporate partnerships and sponsorship. - Jennifer MacDonald, Senior Development Editor, John Wiley & Sons, Inc.
and was always receptive to our editing. He worked diligently to write a great book – on time! I only wish I had more projects for Joe because I know I'd get a great product at the end. Joe has been a wonderful contributing writer for my site. Plus, Joe is just fun to work with…informal, down to earth, and clever. He is also a total professional. He hits deadlines, is a meticulous writer, and participates in the process of coming up with ideas, fleshing them out, and delivering the final product. Joe knows cause marketing, so when we needed a guide for our customers in the financial segment we turned to him. He has great ideas, has seen a ton of what works and is not afraid to share it. The result was a ton of value to our project. We are thrilled (and proud) to share it with our customers. 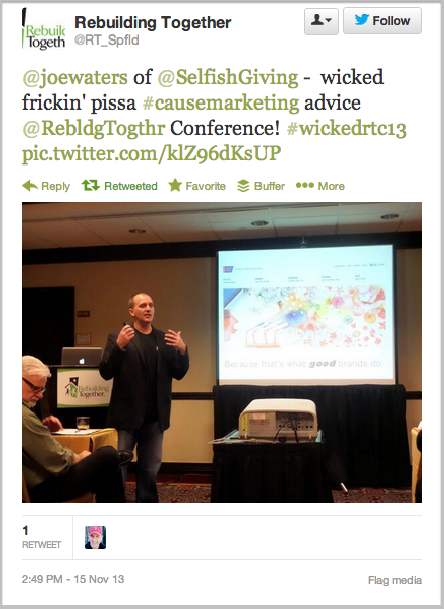 Joe is a great addition to For Momentum’s team of cause marketing bloggers. He delivers insightful, informative, entertaining content on a consistent basis. …oh, and he’s hilarious – so extra points for that! Joe is incredibly easy to work with – highly professional, passionate and always entertaining. He’s full of great ideas and understands how to craft writing that resonates on the web. To top, Joe has an impressive social network and knowledge base which constantly add value and provide important insights in the work he does. Despite being a Red Sox fan, it’s been a pleasure working with Joe. He’s reliable, a great writer, with valuable experience and wisdom to offer our readers. But he goes beyond just writing for us once a week. He works with the group, comes up with great ideas to move the blog forward, and promotes it on his personal channels. Unlike the Red Sox, he’s a real winner.